10. Eye Spy in the Office! 11. Using the Workplace for Exercise! To stretch your neck, slowly flex your head forward/backward, side to side and look right and left. This can be done almost anytime to lessen tension and strain. Never roll your head around your neck. This could cause damage to the joints of the neck. This exercise helps you relax your shoulders. Roll your shoulders forward, then backward, around 10 times. This helps release the tension off your shoulders. Arms need proper rest as most of the work is being managed by them. A good stretch for your arms and shoulders is to brace your hands on the edge your desk, each about a shoulder width away from your body. 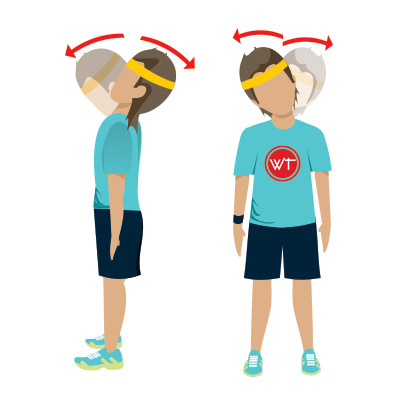 Twist your hands in so they point toward your body and lean forward, hunching your shoulders. Take this a step further and push your shoulders and elbows closer to the desk. We did this in our primary school and it is the need of the hour in a corporate office. Roll your wrists regularly, around every hour or so. Roll the wrists 10 times clockwise, then 10 times counter clockwise. This will help prevent Carpal Tunnel Syndrome if you spend a lot of time typing. You might feel restless and uncomfortable if you keep them left unmoved for some time. Roll your ankles regularly. 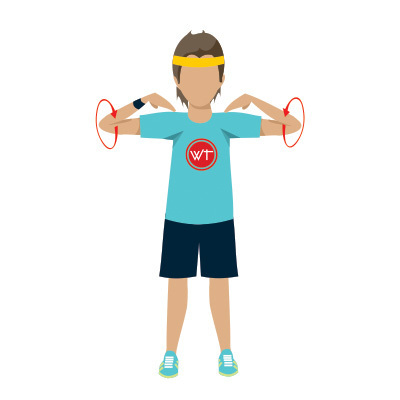 As with your wrists, roll the ankles in a clockwise motion 3 times, then counter clockwise. This helps improve blood circulation, and prevents that tingling feeling you can get when blood circulation is cut off, also known as “Pins and Needles”. Keeping yourself leaned in a particular posture causes you fatigue. To counter that, perform the following exercise: Open your arms wide as if you are going to hug someone, rotate your wrists externally (thumbs going up and back) and pull your shoulders back. 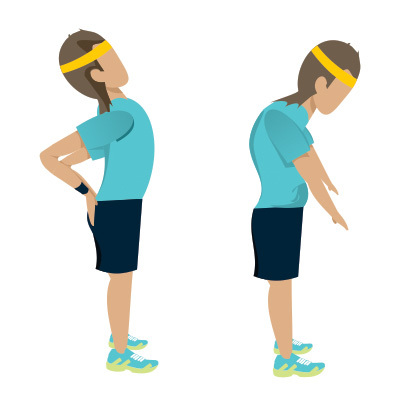 This stretch is moving your body the opposite way to being hunched and you should feel a good stretch across your upper chest. Contract your abdominal and gluteus (hip) muscles, hold them there for a few seconds, then release. Repeat this for every few minutes all day long while you are working at your desk. You can also perform Kegels (pelvic floor exercises) while sitting. Not many of us pay attention to our calves. Calf is the back portion of the lower leg. Stretch your calves. While sitting, lift up your legs on the balls of your feet and set them down. Repeat until your legs are comfortably tired. Repeat after about 10 minutes later, and continue doing this routine for about an hour or so. This will exercise your calves, and will help prevent blood clots from developing in your legs. Blood clots are very common among middle-aged computer users. Keeping yourself fixed in a single posture prevents proper flow of blood in arms, legs and other parts of the body. Stand up every half hour to walk around a bit. This will ensure continuous blood circulation in your arms and legs, and will keep them from getting too strained. Take walks to the water station to refill your glass. If you can afford to take longer breaks, take a short walk outside your building, and use the stairs instead of the elevator to go down. Give your eyes a break from focusing on your screen. Every 30 minutes or so shift your focus from the computer screen and scan around other subjects in the room, such as a window, clock, desk, or door. This helps promote eye movement and lessens chances of eye irritation and headaches. Another technique to relax your eyes would be to rub your hands together, then place your cupped hands over your eyes. Acquire a hand gripper. They are cheap, small and light. When you have to read something either on the screen or on paper, you probably won’t be needing to use your hands very often, so use this opportunity to squeeze your gripper. It is an excellent forearm workout. This exercise is important when you perform lots of mental tasks at a time. Your mind needs proper rest and refresh itself for the complete regime. Take a few deep breaths. To work your abdominal muscles, hold your stomach for a few seconds when breathing in, then release when breathing out. If possible, get some fresh air in your lungs by taking a walk outside, as mentioned in a previous step. Use swivel chair to your advantage with this oblique abs fix. Sitting upright and with the feet hovering over the floor hold the edge of your desk with your fingers and thumb. Next, use the core to swivel the chair from side to side. While seated in a chair with wheels, position yourself at arm’s length from a desk or table and grasp its edge with your hands. 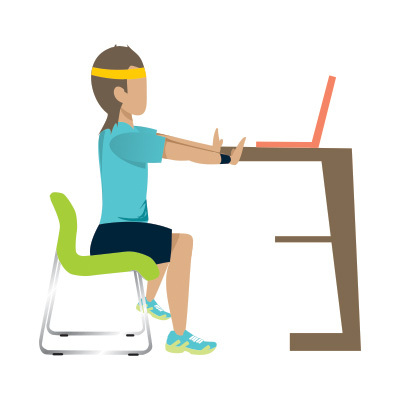 Next, engage the core, raise the feet slightly off the ground, and pull with your arms until the chair slowly rolls forward and your chest touches the desk’s edge. Then roll back by pushing away, with the feet still raised. This might look awkward to your colleagues but we have to do this to keep us fit. Casually lean against the nearest wall, supporting your body with the forearm only. Now lean into the wall until the upper arm almost touches it, and then push back out. Read Work Along Workout for more such Deskercises.